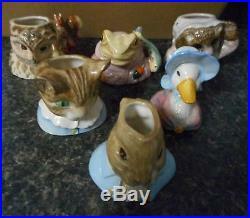 Set of 6 Beatrix Potter Character Jugs made by Beswick (Royal Doulton) consists of Jemina Puddleduck, Jeremy Fisher, Mrs. Brown, Peter Rabbit, and Tom Kitten. 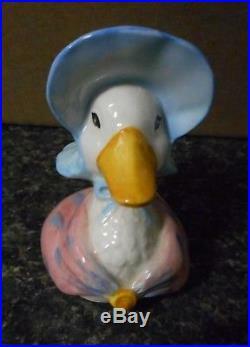 Jemina Puddleduck (#3088) was introduced in 1988 and withdrawn in 1992. Jeremy Fisher (#2960) was introduced in 1987 and withdrawn in 1992. Tiggywinkle (#3102) was introduced in 1988 and withdrawn in 1992. Brown (#2959) was introduced in 1987 and withdrawn in 1992. 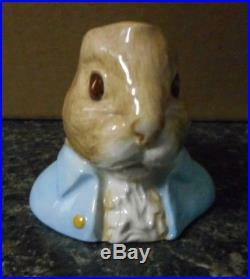 Peter Rabbit (#3006) was introduced in 1987 and withdrawn in 1992. Tom Kitten (#3103) was introduced in 1988 and withdrawn in 1992. 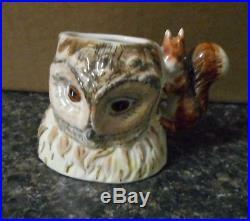 All character jugs are approximately 3½ inches tall. All are in excellent condition with no chips or cracks. 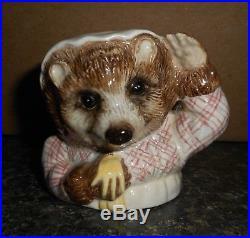 The item "Beatrix Potter Peter Rabbit Character Jugs Set of 6 Beswick (Royal Doulton)" is in sale since Tuesday, April 24, 2018. 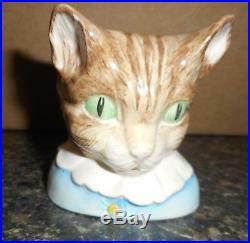 This item is in the category "Collectibles\Decorative Collectibles\Decorative Collectible Brands\Royal Doulton\Animals". 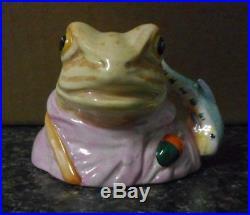 The seller is "curiosities0_1" and is located in Woodway, Texas.